Another one of my favorite vegan-friendly restaurants in Salt Lake City is Mazza Cafe. It’s also another great place for vegans and non-vegans to sit down together for some seriously good eats. I’ve never been disappointed. 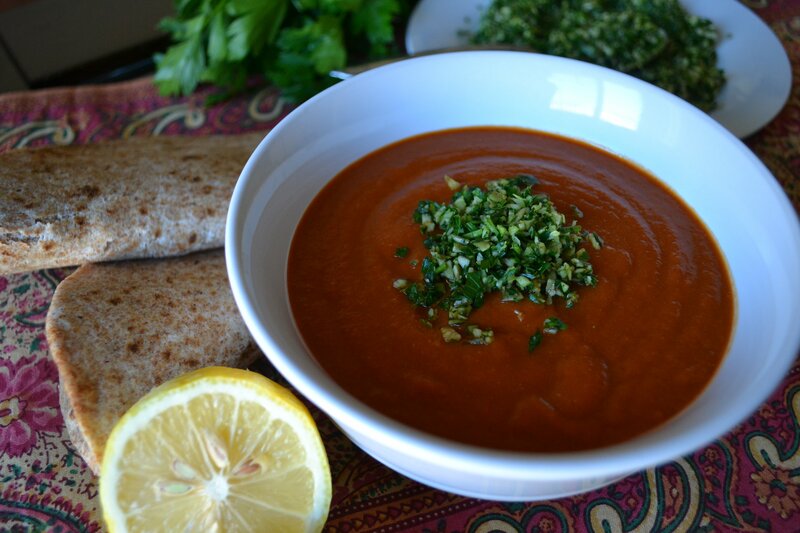 One of my favorites on the menu is their roasted tomato and red lentil soup. It’s rich and dark and warmly-spiced. I have no idea how they make it, but here’s my take on it. Mine is also rich, dark and warmly-spiced. They serve theirs unadorned, but I thought it would be pretty with a little green on top, so I modified the classic gremolata with crunchy pepitas. If you are vegan or vegan-friendly blogger and are looking to meet and greet with other foodies, be sure to sign up for the Virtual Vegan Potluck happening world-wide on November 1. Go here! Preheat the oven to 425-degrees F. In a deep-sided baking dish, toss the tomatoes, onions and garlic with the vegetable broth/water and Liquid Aminos. Sprinkle with black pepper and garlic powder. Roast, stirring occasionally, until the tomatoes, onions and garlic are very soft and beginning to brown, 20-25 minutes. Set aside to cool slightly. When mixture has cooled for a bit, process in a blender until very smooth. Set aside. In a medium-sized saucepan, saute the carrots, onion, celery and garlic in a little bit of water. Cook for about 8-10 minutes or until they begin to soften. Stir in the soy sauce, miso, tomato paste and spices. Add the lentils and 3 cups of the water. Bring to a boil, then reduce heat and simmer until lentils are extremely tender and most of the liquid is absorbed. If beans are still firm, add liquid and continue to cook. Set aside to cool slightly. When lentils have cooled for a bit, process in a blender until very smooth. Now combine the tomato and lentil mixtures in a big soup pot. Add water to reach desired consistency. Gently warm soup, divide among bowls and top with gremolata. In a food prep or processor, combine the pepitas, garlic, parsley and lemon zest. Process until chunky. Can I come and live with you Annie? Don’t know what the restaurant’s soup tastes like but I’m sure your rich soup gave them a run for their money. Great gremolata too. Thanks, lady – I just like the word “gremolata.” It tastes pretty good, too. Oh girl, I want to go swimming in those roasted tomatoes. I’m with toxic vegan, can we set up a commune? I know, right?! Roasted tomatoes. Tasty straight up. Haha! Girl, I was absolutely ragged by last night. I was so sick of my kitchen!! We all want to come and live with her!!! Yum! I think I’m going to try this one since my husband could eat lentil soup every week. I’m starving! I love tomato soup and this looks absolutely gorgeous. I really like the gremolata on top; adds a nice bit of texture. And the lentils add a heartiness that most tomato soups lack. Now I can’t wait for the next cold front to move in so I can make this! That’s what interested me – the lentils! They mellow out the tomato and add a nice thickness. C’mon, cold front ;-)! I have tomatoes and lentils and most of the ingredients handy. Awesome! Dinner solved. Making this tonight. This looks and sounds rich, soothing and so tasty Annie! Would be perfect with a big warm hunk of bread 🙂 This is right up my alley when it comes to soup…YUM! Shira, your bread would be perfect w/ this! And I’m wondering if that recipe might be the answer to my high-altitude bread baking woes. At sea level, I’m fine, but since being in Utah, my bread has – well – sucked! This bowl of soup sounds so warming and filling, the perfect fall meal! Sometimes a bowl of warm soup is just what one needs! You know, I have never made tomato soup from scratch but this has inspired me. The roasting tomatoes look amazing and I love your fresh herb topping to really bring out all the flavours. Usually I make tomato soup from canned tomatoes – delicious – but this didn’t have that kind of not-so-good tanginess that can come from canned tomatoes. A grand & well-flavoured soup that I love! 🙂 I love your special created gremolata! It adds tons of flavour to this beautiful appetizing soup! The red and green together – nice ;-)! That gremolata looks awesome- what a great way to top a soup! I totally need to try that! Oh my goodness, this sounds fantastic! Do you think it would work with whole peeled canned tomatoes rather than fresh? I can’t wait to try it, but the romas around here leave a lot to be desired…although maybe the roasting would help? Courtney, I think that the canned would work, too. On the other hand – something good happens to not-so-good tomatoes when you roast them, so I’d try the fresh romas first. Ohh yes. Another amazing dish. I love this for a perfect fall day! Bring on the soup! Yes ma’am, I agree! It’s soup season! Love gremolata too – what a perfect dish Annie! Thanks, lady! Anne, I hope you’ll join the Potluck! Okay, hon – you’ve got time!